(2001) Compiled by Robert Menua Saleh and Janang Ensiring. Published by The Tun Jugah Foundation. 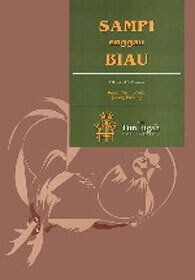 This book is an anthology of sampi and biau. The anthology is made up of 22 sampi and 29 biau, specially selected from the so many sampi and biau recited by the prominent bards during a sampi and biau workshop held in Saratok on 16th and 17th February 1997. Being the first of its kind, the book describes fully well what sampi and biau are all about. People who are interested in reading and understanding sampi and biau (another major component of the Iban oral tradition), will find this book useful.